Follow the instructions for setting the page size and creating a grid given in the Swedish flag example but set the flag width to 270 and the flag height to 180 pixels. Also set the grid spacing to 10 pixels rather than 20 (so we can snap to the flag width which is not divisible by 20). Enable snapping of nodes in the Snap Bar. To add a Guide Line, click-drag starting on a Ruler near the middle and finishing at the desired point on the canvas. (If you start near the edge, an angled Guide Line will be created.) The Guide Line can be moved by selecting (with the Select Tool) and dragging. Be careful not to move the background! If you do, just undo the move ( or Ctrl+Z). To precisely place the Guide Line, double-click on the Guide Line using the Select Tool. A dialog will open where you can type in the exact position required. You can check the Locked box to prevent accident moving of the Guide Line. The Guide Lines can be turned on and off by using the Guide Line ( ) icon in the Snap Bar (recall that you may need to enlarge the Inkscape window to see the icon) or via the command View → Guides (|). 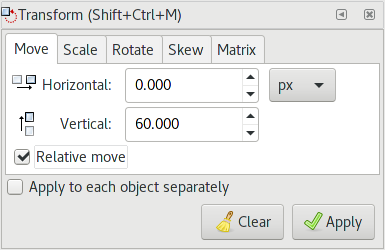 To draw a star, select the Star Tool (keyboard shortcut *) in the Tool Box. You may need to click on the small right-arrow at the bottom of the Tool Box if the icon is not shown to access the pop-up menu. 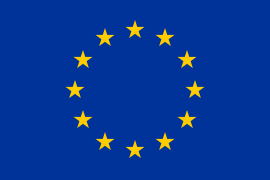 According to the EU flag specification, the stars on the flag are five-pointed with one point straight up. The easiest way to get the star the exact shape is to use the Tool Controls. 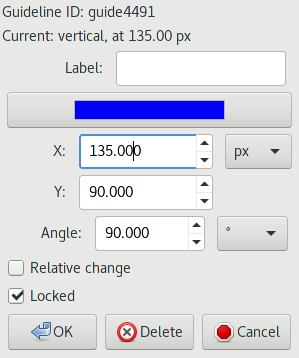 In the Tool Controls, set the number of Corners to 5. 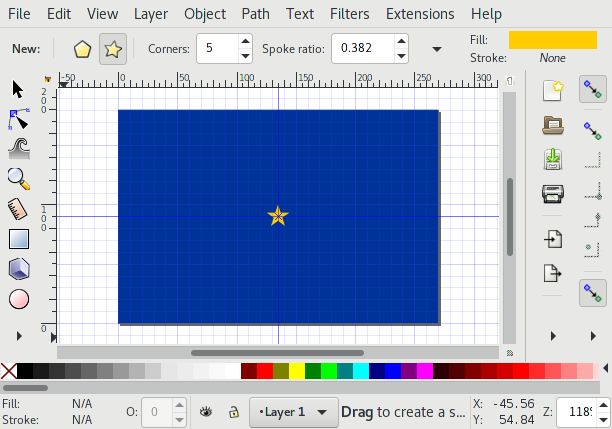 Select the Star icon ( ) to enable drawing of a star. The other entries in the Tool Controls, Rounded and Randomized, should both be zero. Next, select the original star and make a new Clone. This time move the Clone 60 pixels down (−60). Repeat for the Horizontal (x) direction. For the rest of the stars, use the eight permutations of x(y) = ±30 and y(x) = ±52 pixels (60 times the sine and cosine of 30°, respectively).